The other day a friend was telling me about a documentary he watched on TV. 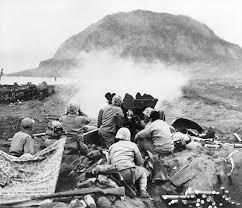 It was about the battle of Iwo Jima. He related a story a survivor told. He had watched one soldier kneeling down in prayer, and he was thinking of joining him when a bullet came in and killed the praying one in the head. Immediately, the other man said to himself, the heck with this and ran. I know this may be goofy, but these things intrigue me. If we start with the premise that God is good, all the time, why was this man of faith was killed, while the non-believer survived? Of course, only God himself knows the real answer. But I think this was an act of mercy. What is mercy? It is when love expresses compassion, when anyone is in need of help. So mercy proceeds from and is the effect of, love toward the needy and miserable. This emotion, or spiritual energy cannot be expressed, or even exist if one is regarding one’s own self, and their needs only. “Then Jesus said to him, “I promise you, today you will be with me in paradise.” (Luke 23:43 ERV). So Jesus told the thief hanging on the cross next to him, he would soon be leaving this hell he was in, to be somewhere his soul would soar with peace and delight. Mansions or many rooms signify a dwelling place of extreme comfort. Again a place where the soul would soar with peace and delight. So I would put forth the proposition, God, from a position of love had mercy toward the praying solder. The bullet that hit him, killed him nearly instantly. He may have experienced a micro-second of brain fizzle and pain, but immediately fell in to unconsciousness. After that, an angel or two came and got him. Like the thief on the cross, he went from the hell he was in, to be somewhere his soul would soar with peace and delight. The solder who almost was drawn into prayer, turned to self preservation, and ran away. “Yes, many people are invited. But only a few are chosen.” (Mat 22:14 ERV). The non-believer sensed the call and invitation and felt compelled to join in the prayer. But he rejected that and ran from the danger. Every single human being is called. But the praying man was chosen because he had made the decision to join in fellowship with God. “Two people will not walk together unless they have agreed to do so” (Amos 3:3 ERV). “To all to whom the rewards of heaven are promised they shall be given. Nothing shall be withheld that was promised” Albert Barnes.